Das Buch der Tausend Nächte und der einen Nacht (Original-Titel: persisch: Hazar-o-yak sab, arabisch: Alf layla wa-layla). Vollständige und in keiner Weise gekürzte Ausgabe nach den vorhandenen orientalischen Texten besorgt von C.v.Karwath; mit Illustrationen von Choisy Le Conin (d.i.Franz von Bayros,1866-1924), E.Rantzi, R.Matthieux, R.Chaplin, Fernand d\'Or und Raphael Kirchner (1876-1917). Ab Bd.XI herausgegeben von Adolf Neumann. London: The Groiler Society, 1906. Leather_bound. 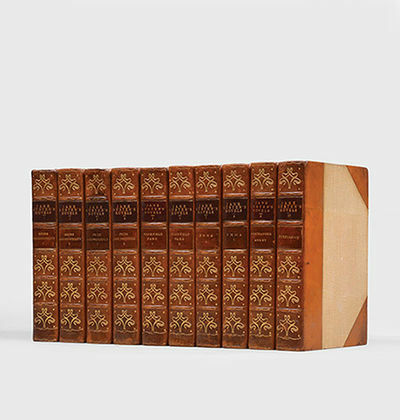 Nine volumes. Tall octavo. The History of India. From the earliest times to the sixth century B.C. by Romesh Chunder Dutt., edited by A.V. Williams Jackson. The Connoisseur Edition is limited to two hundred copies which this is number 7. Over 300 hundred illustrations plates frontispiece are in two states one in color other in black and white with title tissue guard, many reporduction of historical photogravures plates. Bound in three quarter green morocco, marbled boards, top edge gilt, spine in compartments with gilt decorations of palm leaf motif, gilt title, raised bands, marbled endpaper. Fine. London: Cassell and Company Limited,, 1906?7. 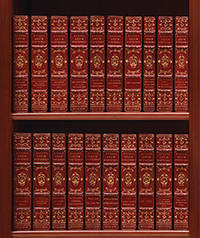 20 volumes, octavo (215 x 145 mm). Contemporary red half levant morocco, spines gilt in compartments with central thistle tool, titles gilt direct, raised bands, red cloth boards, top edges gilt, others untrimmed, marbled endpapers. Frontispiece to each volume. Extremities lightly rubbed. An excellent set. The Pentland Edition. Limited edition of 1,550 numbered copies, of which this is number 143. Peter Pan in Kensington Gardens. (From \"The Little White Bird\"). With drawings by Arthur Rackham. (Second edition). 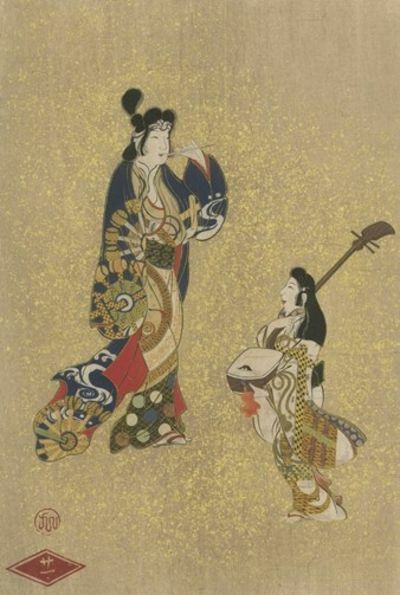 5 volume study and presentation (in English) of the history of Ukiyoye painting and woodblock printmaking, defined in the preface as genre pictures and popular works depicting manners and customs of the time as opposed to classical works, including an altogether 211 pp. text distributed throughout the volumes, 156 fine text illustrations, mostly from line drawings, and 170 superb mounted plates, some in photogravure, but most from exquisitely rendered original woodblock prints done by an array of artists after the original works. Several leaves in the second volume damaged at fore-edge and into the extremities of the sheets; a sharp object pierced the chitsu case. Large folio. Illustrated paper covered boards, elaborately tie-bound in the Japanese manner, housed in damaged chitsu cases (one case lacking). Tokyo (Shimbi Shoin) 1906-1907. One of six hundred sets. - Radierung v. H. Ulbrich b. Langewort, 1906, 63,5 x 46 (H) - Blattgr. 95 x 72,5cm Große Ansicht des Eingangsbereiches, die Hugo Ulbrich 1905 radierte. - In Braun gedruckt auf festem Velin bei Angerer in Berlin. Kleine, hinterlegte Druckstelle rechts im breiten Plattenrand unten, leicht angestaubt, insgesamt aber gut erhalten. Unten links in der Platte monogrammiert und datiert. Das Buch der Tausend Nächte und der einen Nacht. Vollständige und in keiner Weise gekürzte Ausgabe nach den vorhandenen orientalischen Texten, hrsg. von Cary v. Karwath u. Adolf Neumann. 18 Bände (vollständig). E. W. Stern 1906-1914, Wien - 8vo. Mit 14 Taf. (3 farbig) v. Choisy Le Conin (d. i. Franz von Bayros), E. Rantzi, R. Matthieux sowie zahlr. Vignetten. OHldr. auf 5 unechten Bünden m. Rückengoldprägung u. grünen RSchildern. Kopfgoldschnitt. Hayn-Gotendorf V, 278: "Erste einheitliche deutsche Ausgabe, welche die Eigenart des orientalischen Urtextes wahrt." - Eines von 520 handnumer. Ex., erschienen als Privatdruck, hier in der schönen Halblederausgabe. Aus Zensurgründen wurden die Tafeln zu Band 5-18 (außer 2 in Bd. 8) separat verschickt und liegen auch hier, wie fast immer, nicht bei. - Einbände minimal berieben, am Rücken teils gering aufgehellt, Längsschnitt teils etw. stockfleckig, sonst sehr schöne, wohlerhaltene Bände, nur leider leichter Rauchgeruch. Exlibris im Innendeckel. gr. 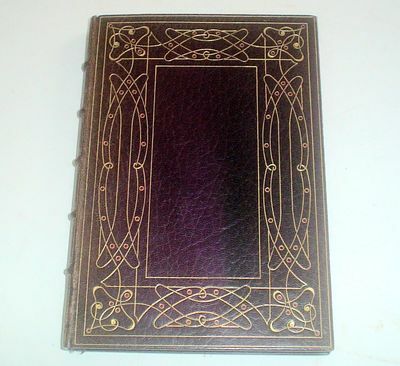 New York & London:: Frederick Warne & Co,, 1906 [December].. Second printing.. Hardcover. Very Good. Grey wallet from which story folds out in a continuous strip. Story complete, folds good. Faint soiling to some openings, and minor damp adhesion damage to the white and green edge at the first opening. Former ownership name in pencil to back of final opening. Printed inner surface of front cover is scratched. 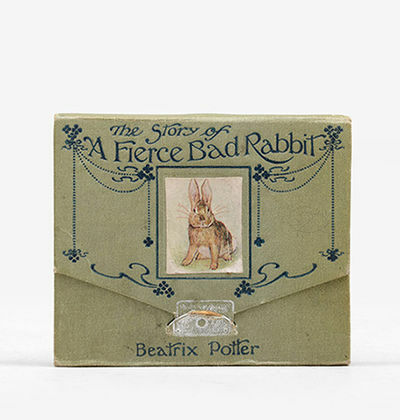 The grey cloth-covered card wallet is printed in navy and bears a pasted-on illustration of Miss Moppet: part of the top of the illustration had been torn off: the image has now been restored (as in picture restoration), as have the inner joints of the wallet, and the tab which slots in to close it. A very nice firm copy. Taschen-Notizbuch für das Südwestafrikanische Expeditionskorps. Nils Holgerssons underbara resa genom Sverige. Bind I-II. Winchester, VA, and New York: The Eddy Press Corporation,, 1906. And other Poems. Octavo. Original finely diapered green cloth, title gilt to the front board. Just a little chafed at the extremities, pale toning, else very good. 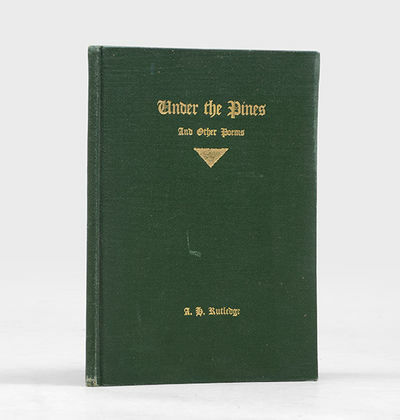 First edition, privately printed. The first book of poems by South Carolina's first poet laureate (1934-73). Edinburgh: John Grant,, 1906. 10 volumes, octavo (201 x 135 mm). Contemporary tan half calf, burgundy and brown morocco labels, gilt decoration to spines, raised bands, pale brown cloth boards, top edges gilt. Engraved frontispiece to volume 1. Some occasional light foxing, spines slightly rubbed, an excellent set. 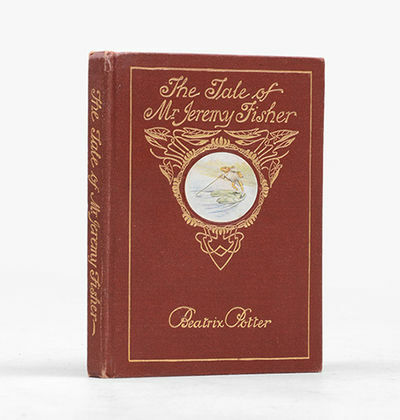 The Winchester edition; considered the most attractive of the unillustrated editions of Jane Austen's works produced around this time. A handsomely bound set. Thoma, Ludwig , Schriftsteller (1867-1921). München, 1. Januar 1906. - 2 SS. 8vo. An einen namentlich nicht genannten Adressaten: "Ich muß bei Abschluß des alten Jahres dankbar daran denken, wie lieb Du und deine gute Frau Wally Marion + mir entgegengekommen seid. Dafür sage ich Dir herzlichen Dank. Und grüße Dich und Wally vielmals. Ich bitte Dich, mir Deine Freundschaft auch in kommenden Jahren zu erhalten [.]". - Mit kleinen Randläsuren. - Folio (ca. 350 x 270 mm.) Disbound. 1f. (title), [i] (blank), [i] (dedication), 14, 1f. (blank) pp. Notated in blue and red ink on 22-stave music paper blindstamped "H. Lard Esnault Ed. Bellamy Sr. Paris" at upper inner margins.With the autograph signature of the composer ("Roger-Ducasse") and date ("Octobre 1906") to lower portion of title. Includes two autograph dedications, one to the harpist Albert Blondel at upper margin of title and the other "A Jean Aubry, en souvenir du 24 février. Très amicalement R.D." to the verso of the second leaf.The complete score of this work for harp in orchestral reduction, with the harp part notated in blue ink and the orchestral part in red. With numerous annotations, corrections, and performance markings in pencil in another hand, almost exclusively to the harp part.Slightly worn and soiled; short tears and remnants of sewing thread to inner margins. Variations plaisantes was first performed in Paris on January 24, 1909, with the renowned harpist Marcel Grandjany (1891-1975) at the harp. A. Durand published the work in both full score and piano reduction in the same year.Roger-Ducasse "studied composition with Fauré, counterpoint with Gédalge, harmony with Pessard and piano with Charles-Auguste de Bériot. He was a founding member of the Société Musicale Indépendante (1909) along with Ravel, Vuillermoz and Koechlin. A friend of Debussy's, he gave an early of performance En blanc et noir with him in December 1916, and was with Chouchou (Debussy's daughter) when Debussy died." Barbara L. Kelly in Grove Music Online.Music critic Georges Jean Aubry (1882-1949), the second dedicatee, "belonged to a circle of avant-garde musicians and littérateurs and was a frequent contributer to periodicals. Encouraged by his 20-year friendship with Debussy, he wrote enthusiastically in support of contemporary French composers, noting similarities between their music and that of the 18th century (Couperin, Rameau)." Grove Music Online.This attractive and carefully executed manuscript, with its numerous annotations and corrections, offers harpists and scholars alike an intriguing glimpse of the genesis of the piece. Many of the corrections were incorporated into the Durand edition; some differences between this manuscript and the published version, however, remain. London: Frederick Warne and Co.,, 1906. Sextodecimo. Original red moirÃ© cloth, titles and decorations to spine and front board gilt, pictorial label to front board, all edges gilt. Housed in a brown cloth chemise and brown quarter morocco and cloth slipcase. Frontispiece and 26 colour illustrations by the author. Spine rolled, tips and spine ends a little rubbed, front hinge split with glue repair, some light marks to contents, glue spot to p. 14. A very good copy. First edition, deluxe issue. The first two impressions are indistinguishable. Macmillan & Co. Ltd. London. 1906. Reprint of the 1889, fifth Fitzgerald edition. 8vo. (8 x 5.6 inches). iv, 112pp. Contains the fifth and first edition texts, plus notes on Omar Khayyam and the poem, and comparisons between the first four editions. Finely bound, for Hatchards, in early full dark purple morocco. Spine with five raised bands, each with gilt piping. Compartments lettered and decorated in gilt. Front board with elaborate decorative floral design in gilt, embellished with red morocco inlay dots. Rear board with double gilt ruled border with red inlay dots to the corners of the inner border. Board edges with single gilt rule. Inner board edges with tripe ruled line borders and dotted corners. Marbled endpapers. All edges gilt. Some very light rubbing to extremities and the colouring is faintly darker to the outer boards but overall a lovely copy in a highly decorative early twentieth century fine leather binding. ASNE D' OR. ( numérotés). [Ford, Ford Madox] Ford Madox Hueffer. THE FIFTH QUEEN TRILOGY: THE FIFTH QUEEN: And How She Came to Court; PRIVY SEAL: His Last Venture; and THE FIFTH QUEEN CROWNED: A Romance. London:: Alston Rivers/Eveleigh Nash,. 1906 - 1908.. First editions. Three volumes. Arthur Marwood's copies, with his ownership signature on front endpaper of THE FIFTH QUEEN and the FIFTH QUEEN CROWNED being the DEDICATION COPY, INSCRIBED ON THE DATE OF PUBLICATION, [to] "Mr. & Mrs. Arthur Marwood / Always affectionately from / Ford M. H. / 26th March MCMVIII." 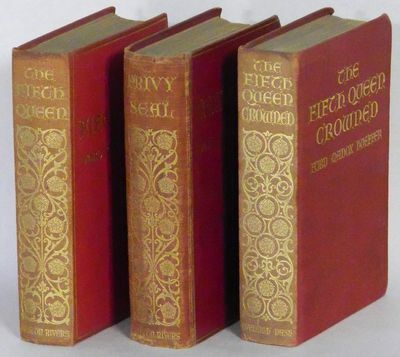 The "Fifth Queen" trilogy is one of Ford's best-known achievements and is considered, as Joseph Conrad termed it, "the swan song of historical romance." Based on the life of the fifth wife of Henry VIII--Catherine Howard, Queen Consort of England from 1540 until 1541--who married Henry on July 28, 1540, at Oatlands Palace, in Surrey, almost immediately after the annulment of his marriage to Anne of Cleves, and was beheaded after less than two years of marriage on the grounds of treason for committing adultery while married to the King. The recipient and dedicatee, Arthur Marwood, was a good friend of Ford's, involved with him and his magazine,''The English Review," and the model for (or at least partially so) "Christopher Tietjens" in one of Ford's most famous works--his PARADE'S END tetralogy. Ford himself was said to have always made much of Tietjens's resemblance to Marwood [Mizener, THE SADDEST STORY]. All three volumes with spines tanned and scattered foxing to page edges--about very good or better. The first volume with only moderate wear but endpapers darkened (due to the binding) and first few leaves foxed, otherwise very good or better; the second volume is a little rougher, with spine folds rubbed and ends beginning to fray, otherwise very good; the third volume is very good or better. .
London & New York: Frederick Warne and Co.,, 1906. Sextodecimo. 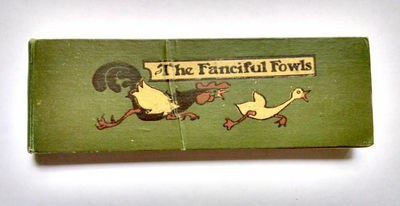 Panorama mounted on pale green linen back, arranged in pairs with text on recto and illustration on facing verso, and folded concertina-style into the original green cloth wallet case, with closing tab heightened with silver. Colour pictorial label on front cover. Housed in a custom green cloth folding case. With 14 colour illustrations by the author. Covers a little toned and marked, some wear to tab-slot, some rubbing to extremities. An excellent copy. 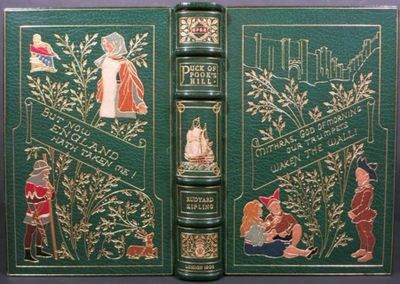 First edition, first issue, with "London & New York" on the rear cover, in the usual green wallet case binding. London: J M Dent & Co Unpaginated. Oblong (2.5" H x 7.75" W). Green cloth with stamped design and titling in yellow, black and red. Crease in cover, corner bends on first 4 pgs. Pictorial endpapers. Printed one side only. Amusing verse on one side, cartoon-like color illustration opposite throughout. Extremely scarce Robinson title. No date, but 1906 (De Freitas). . First Edition. Pictorial Cover. Very Good. Illus. by Charles Robinson. Oblong 12mo. London: Macmillann and Co., Ltd, 1906. First edition. The book in pristine condition but for one small closed puncture tear to page 191. Box also fine. First edition. Crown 8vo. x, 306p, 1 leaf ads. Illustrated by H. R. Millar with frontispiece and 19 full-page plates, the plates figured in the pagination. Bound by Sangorski & Sutcliffe in 1941 in full green crushed morocco, a.e.g., the edges gauffered with decorative borders and floral designs, the flower petals and leaves hand painted in red and pale green, the spine in five uneven panels, the central larger panel with gilt borders in a rope design surrounding a sailing ship with onlays in red and white, the smaller panels with title and densely gilt designs featuring a Roman device and a Tudor rose surmounted by a crown, these panel also with red and white onlays. The covers have overall gilt titles and pictorial designs featuring stylized titles and seven characters and animals onlaid with seven different colors, the board edges with gilt fillets and decorative rolls, the doblures and flyleaves in front and rear are decorated with gilt sprays of flowers and trailing vines, all four pages in blue morocco and each featuring onlaid characters, a sailing ship, and or a crest, the four pages with the entire text of "Pucks' Song" lettered in gilt, additional flyleaves in blue silk. Housed in a green morocco felt-lined morocco solander box also signed Sangorski & Sutcliffe. An amazing fine binding. Livingston no. 299; Stewart no. 306. Neuchâtel, Delachaux & Niestlé, s.d. . - Gr. in-4°, XLI-118p. Deuxième édition. Illustré de 52 planches chromolithographiées (et non pas 54 comme faussement dit en page de titre) en couleurs. Dans cet exemplaire, il a été rajouté les 2 planches de dessins en noir (planches 53 et 54) que l'on ne trouve généralement pas dans cette seconde édition. Très bel exemplaire. Reliure demi-toile bleue à coins, titre doré au dos. Illustrierte Romane. (Reisen und Abenteuer). Hrsg. v. Dietrich Theden. 3 Serien in 30 Bänden (alles Erschienene). Boston 1906, Houghton. FIRST EDITION. Green cloth, 2 vol.set. 475+534p., very good, top gilt. FIRST & LIMITED EDITION OF. 200 COPIES. WITH HEARN'S MANUSCRIPT LEAF TIPPED IN. RARE !. THE FIRST & LIMITED EDITION OF 200 COPIES WITH MANUSCRIPT This work was issued in two basic editions: First Limited Edition of 200 Copies with Manuscript, and the First Trade edition, both in 2 volume sets. The FIRST LIMITED EDITION OF 200 COPIES contains a sheet of Hearn's actual holographic and penned manuscript, properly tipped in volume one. There are only two Hearn leaf book titles by Hearn: this example, and the other title is the complete Writings of Lafcadio Hearn in 16 volumes. The trade edition of this title looks quite similar to the Limited Edition, in that both are bound in green cloth with top gilt, but the Limited Edition has a manuscript leaf and paper lables on the spine. This has always been one of Hearn's rarest and most desirable titles for collectors & libraries alike. This is essentially a bio- graphy by his very close friend and fellow writer. Hearn has referred to Ms. Bisland as his "...literary brother" see the quote in volume 1, p.389. Please see our other listings for a manuscript letter from Hearn to Bisland whom he correspon- ded with often. Because Bisland carried on an extensive cor- respondence with Hearn, her ability to write a true & proper biography was a foregone conclusion. This set is illustrated with 16 photos and gravures, with frontispieces of Hearn. By and large the best and most reliable of all Hearn biogra- phies due to Bisland's primary knowledge of Hearn, something most other biographers can not say. For references see BAL 7944. Perkins: p.54-55 for comprehensive bibliographic deta- ils. AN EXCEPTIONALLY RARE MANUSCRIPT LEAF SET ! Color scans can be sent by email. Images displayed may not always be the exact photo of the copy in stock for sale at any given time. If you want to see the exact image of the book or edition in stock today, please request this by email. . Photos of most of our books are posted to our . Illustrierte Flora von Mittel-Europa. Mit besonderer Berücksichtigung von Oesterreich, Deutschland und der Schweiz. Das Buch der Tausend Nächte und der einen Nacht (Original-Titel: persisch: Hazar-o-yak sab, arabisch: Alf layla wa-layla). Vollständige und in keiner Weise gekürzte Ausgabe nach den vorhandenen orientalischen Texten besorgt von C.v.Karwath; mit Illustrationen von Choisy Le Conin (d.i.Franz von Bayros,1866-1924), E.Rantzi, R.Matthieux, R.Chaplin, Fernand d`Or und Raphael Kirchner (1876-1917) u.a. (ab Bd.XI herausgegeben von Adolf Neumann). Wien, C.W.Stern, 1906-1914. - XI,297;VII,316;VI,290;244;VI,359;VI,331;279;VII,279;309;309;304;305;307;305;307;376;319;356. Mit 73 Tafeln und 23 Vignetten/Schmuckleisten. Text 2-farbig gedruckt. Nr.248 von 520 nummerierten Exemplaren. Hayn-Got.IX,576 und V,278. Rare complete edition of the Arabian Nights, illustrated with 73 plates. 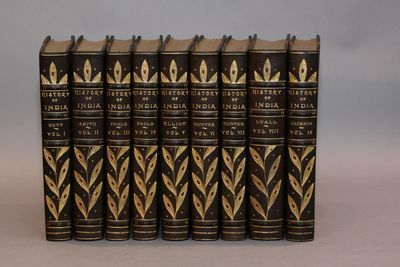 Bound in 18 volumes, turquoise original silk, with inlaid triangular metalvignette at front covers (8 replaced with paperlabels) and label to spine (spines faded). Illustrated by Franz von Bayros, E.Rantzi, R.Mathieux, R.Chapelin, Fernand d`Or and Raphael Kirchner /// "Auf der Übersetzung von R.Burton beruht die Wiener erotische Ausgabe des Verlags C.W.Stern (1906-1914), angeblich aus orientalischen Texten übertragen von C.v.Karwath" (KNLL 18,99) /// Rücken geblichen. 8 Kupferplaketten mit kalligraphierten Papier ersetzt. Sprache: Deutsch Gewicht in Gramm: 14000 21,5 x 15,5 cm. Türkis Original-Seideneinbände mit goldener Brokatstickerei, dreieckigen Supralibros-Kupferplaketten mit arabischen Kalligraphie gestantzt und montiert. Dreieckigen Rückenschild mit der Bandnummerierung sowie Kopfgoldschnitt und Lesebänder. London & New York: Frederick Warne and Co.,, 1906. Sextodecimo. 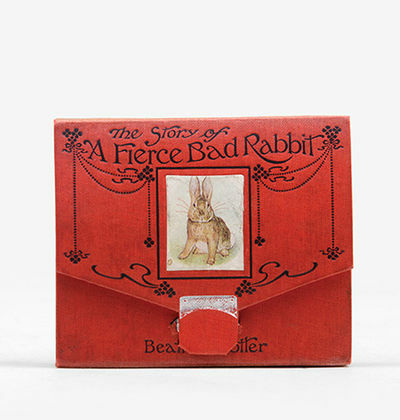 Panorama mounted on pale green linen back, arranged in pairs with text on recto and illustration on facing verso, and folded concertina-style into the original red cloth wallet case, with closing tab heightened with silver, and pictorial label to front cover. Housed in a red flat-backed solander box. With 14 colour illustrations by the author. Sides faded, some marks to covers, a little foxing to linen back of concertina, text and illustrations unaffected. An excellent copy of a publication too easily subject to wear. First edition, first issue, with "London & New York" on the rear cover, in a variant binding not noted by Quinby. 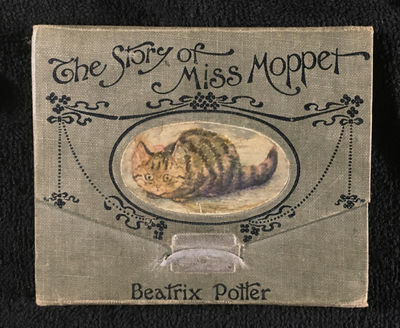 At the start of 1906, Potter planned three books in a panoramic form, with 14 pictures and 14 pages of text: The Story of a Fierce Bad Rabbit, The Story of Miss Moppet, and The Sly Old Cat, but only the first two were published. Issued for the 1906 Christmas market, the books were too easily damaged, so "the shops sensibly refused to stock them because they got unrolled and so bad to fold up again" Potter wrote (Linder, p. 183). The panoramic design was dropped and the books brought into line with the rest of the series in 1916 (see item 36 below). The Warne archive contained two copies of this red variant, both stamped "Not to be taken away". Perhaps the red outer case was judged to be a mismatch with the green linen-backed material inside it and it remained a trial binding. It is certainly much the rarer of the two. London: [Leonard Smithers], 1906. First edition, LIMITED TO ONLY 120 HAND-NUMBERED SETS. Proof Copies of the Plates. 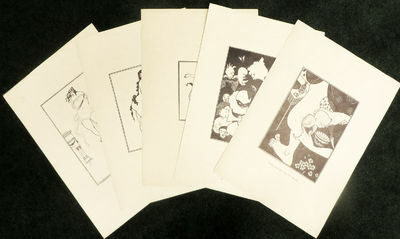 Five plates by Aubrey Beardsley "to free in design for general circulation" printed on Japan vellum. Foolscap folio, loose as issued, now housed in a fine portfolio of linen backed handmade paper covered board chemise in a handsome white alum-backed slipcase of plum paper-covered boards, the spine with burgundy morocco label lettered and trimmed in ornate gilt. Title-leaf, contents leaf, five plates, colophon leaf. A very fine copy, beautifully preserved. VERY SCARCE COLLECTION OF FIVE PUBLISHED ILLUSTRATIONS CONSIDERED TOO RISQUÃ‰ FOR GENERAL PUBLICATION, three illustrating Juvenal's "Sixth Satire," and two prepared for Lucian's "True History". "This issue contains five exceedingly brilliant Drawings by the late Aubrey Beardsley which have been regarded as too free in design for general circulation. Three of these illustrate THE SIXTH SATIRE OF JUVENAL (the Satire against Woman), and the remaining two designs were intended for LUCIAN'S TRUE HISTORY issued about twelve years ago, but were never included in the volume. These Drawings are printed from the original blocks, and as only a few engraver's proofs have previously been pulled, the impressions are perfectly clear, and may be regarded (considering the few copies now printed) as Proofs." - Colophon. PHOTOGRAPH ALBUM Of IRON, COPPER, And COAL MINING COMPANY OPERATIONS, 1906 - 1910. Plus Blueprints, Photographs of the New York Aqueduct and Bridges in Connecticut (1912), Personal Scenes from the Photographer's Travels, etc. (n. p.). Circa 1906 - 1912. Dark olive green cloth "Moore's Loose Leaf" post binder, numbered and ruled paper leaves printed recto only; photos affixed to rectos. Light soiling and wear to boards and paste-downs; light soiling to beginning and end leaves and occasional margins; light tan discoloration from paste backing to many photos and to some facing blank versos. Few photos under-/ over-developed or slightly blurry, but most crisp, clear and well-contrasted. VG condition overall.. 251 leaves, including 22 unused preliminary leaves and occasional blank leaf separators; two unused sets of "Moore's Moveable Markers" (alphabetical tab dividers) bound in at rear. 476 b/w silver gelatin photographs affixed to leaves with paste, many numbered, captioned and/ or denoting general location. Most ~ 1-3/4" x 2-1/2"; some 3" x 4"; few ~ 4" x 5" or larger; very few hand-colored. Additional illustrations include one half-tone fold-out of a grouping of six images from the album (6-3/4" x 9-1/2"); two half-tone b/w images of mining apparatus with printed captions; three blueprints (avg. 4-1/2" x 7-1/2"; and seven envelopes containing ~75 negatives. 5-3/4" x 8-3/8" A detailed photo album depicting various aspects of the operations, technology, and locations of mining companies in Michigan, Colorado and Pennsylvania, presumably compiled by a publicity photographer. The photographs are neatly organized into headed and/or titled sections. Although primarily showcasing the buildings, equipment, etc., involved, they also include both posed and action shots of managing staff, miners at work, and possibly the miners' or other employees' families, as well. The operations depicted include Cleveland-Cliffs Iron Company's Ishpeming, Negaunee, Maas, Salisbury, Cliff Shaft, Princeton and Austin mines, as well as a shipment of ore being loaded at Marquette, presumably belonging to CCI Co (1908); Calumet and Hecla's Red Jacket Shaft, Whiting System at Tamarack, a man-skip, etc. (1908); Michigan Smelter's furnace house, sluiceway, electric locomotor, cooling slag, and more (1908); Plymouth Coal Company's (PA) plant, colliery, compressor, shafts, and named workers (1906? ); Liberty Bell Mill (ca 1912); and others. 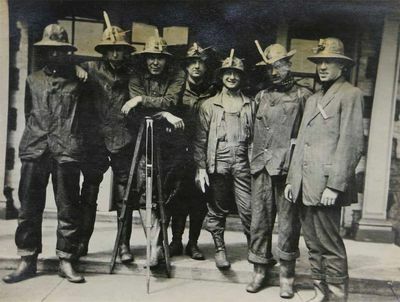 Additionally, one section is devoted to what appears to be a surveying crew for the New York Aqueduct in Stevenson, Connecticut. Sections of personal photographs intersperse many of the professional photographs, most dated 1909-11, and include friends and scenery in Big Indian, NY; Deertrail, Mt. McClellan, Pike's Peak, Clear Creek, Garden of the Gods, etc., Colorado; a rodeo or horse race in Cheyenne, WY; and both hiking and mining in Moab, UT. All in all, a remarkable photographic documentation of the early turn-of-the-century iron, copper and coal mining operations of some of the biggest mining companies at the time. NY/London: Putnam's/Everett, 1906. First American. Hardcover. VG+ to near Fine. 2 volumes: 292 & 292 pp. One of the more detailed biographies. Penzer pp 213-332. Penzer spends more time on this on this title than any other, but considering the amount of criticism, it is likely because he was jealous. A lovely set in original cloth. Theorie der stationären Strahlung in einem gleichförmig bewegten Hohlraum. Dissertation. Berlin, 8. Oktober 1906. - 1¾ SS. 8vo. Einriß im Mittelfalz. An Felix Hollaender, dem er zu einem Todesfall in der Familie kondoliert: &#132;[ ] eben höre ich im Theater, welch ein schwerer Verlust Dich betroffen hat. Ich bitte Dich, die Versicherung meiner aufrichtigen herzlichen Theilnahme entgegenzunehmen und meine Anteilnahme auch deinen Angehörigen auszusprechen. Ich wünsche Dir von ganzem Herzen, daß Dir das, was Dir in diesem Augenblick an menschlicher Liebe verloren ging, das künftige Leben reichlich ersetzen möge [ ]".